Kim is on a mission to capture the spirit of children from all walks of life whether happy, sad, innocent, mischievous or homeless. God had given her a desire of her heart. 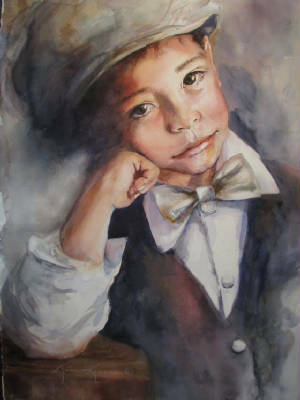 She is mostly self taught in portraiture, and has journeyed from just replicating a photograph to capturing an emotion. She loves the transparency and excitement when complimentary colors are allowed to blend and areas are left up to the viewers' imagination. With many lost and found edges the paintings are more interesting. She believes it is more powerful when lights and darks play off one another. It's all about value and contrast. Kim works mostly from photographs on a commission basis.